The iconic smiley logo is ratcheting up its presence in India on the 46th anniversary of the ubiquitous marker of good vibes. The slightly goofy, yellow smiling face, trademarked by its creator French journalist Franklin Loufrani in 1972, is transforming into a commercially successful juggernaut of joy in India, aiming to increase its revenue about four-fold in three years. “Smiley is about spreading happiness," said Franklin’s son Nicolas Loufrani, who was in Mumbai last week to speak at the Indian Fashion forum and firm up Indian partnerships. “We want to spread happiness. We see smiley as a little positive virus that’s here to remind people to be positive and smile." The 46-year-old CEO of the Smiley Co. was speaking a few days before the International Day of Happiness on 20 March. The firm already has successful licensing deals with retail clothing brand Lifestyle and gift store Archies for use of the Smiley logo on their products and has partnered with Dream Theatre, a licensing agent in India. In the coming months, Smiley tie-ups in the form of food products, stationery, school bags, gift items, clothes and toys are expected to be rolled out. The Smiley business in India is at $5-6 million in retail. “In the next three years, we are targeting Rs150 crore (around $23 million) at retail, across categories," said Jiggy George, CEO of Dream Theatre. “Now a lot of brands communicate around happiness," said Loufrani. “My father was really the first one to use happiness as a marketing concept and push it. That was his value and philosophy and vision when he started." Since Loufrani joined the company in 1996, when the family founded the Smiley Co. in London, the smiling face logo has become an entrenched brand, shooting off in new directions and spawning licensing deals in more than 100 countries across 12 product categories. “I personally think that it’s good for brands to be associated with a positive message of spreading happiness," he said. “I think most people aspire to be happy and this is something as universal as possible without being controversial." Smiley Co. has more than 260 licensees globally, selling more than 23 million products in a year. “You don’t sell the same product to the same people," he said. “If you want to be universal and if you want your emotion and message to be for everyone, you need to target different consumers with different products." In the late nineties, with the advent of texting and the digital boom, Loufrani saw further adaptive possibilities in the smiley, including the potential for communication. In 2001, the company launched the Smiley Dictionary with more than 3,000 symbols, each riffing on the basic round face with different moods, colours and patterns—including animals, fruits and flags. “I announced the birth of a universal language," Loufrani said. 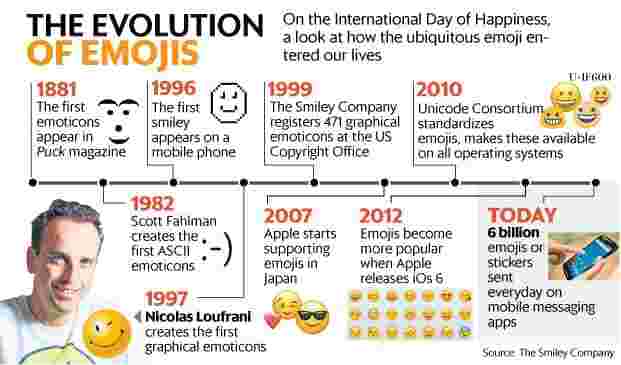 “My vision—and it was a self-fulfilling prophecy—was that we are going to create a new form of language, of communication, replacing texts by smileys, which is what happened. Now billions of people are using graphics in their communication." The company’s studio creates hundreds of new smiley designs every year, and each is individually protected. “Any artistic creation is protected by copyright laws… and they are our creation so we have the right of controlling their use," Loufrani said. “Other people can create other sorts of happy faces or other sorts of graphics, like emojis. They have a very distinctive arts direction. I prefer ours, of course." He laughs: “We have this classic retro look that makes it cool."